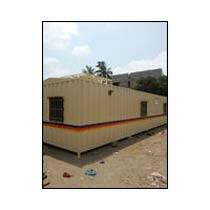 We are a world class manufacturer and supplier of Prefabricated Office from Karnataka, India. The material used for manufacturing this office if of premium quality. We offer Prefabricated Office in a wide range of styles, designs and size. Backed by a team of experienced professionals and advanced manufacturing unit with all sorts of latest technology we have managed to meet the varied requirements of our esteemed clients. Just let us know the details and we will come up with the finest customized Prefabricated Office.